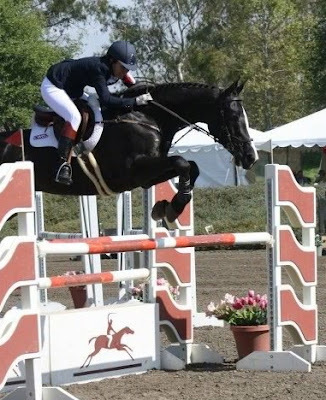 This installment of Billy's FEI Journal will decidedly have more reflection about growth and experience than cheerleading about our accomplishments following our performance at the Galway Downs CIC 2**. Growth is always a good thing in my book, but growing pains are inevitable and are frankly a little rough on the ego when the chance at a high placing slips through your fingers. But the ego is quickly healed, when looking in a different light, at the realization that the prize in some situations is that you had the courage to take the risk and put yourself in the game. You have to play to win, in that order. That being said, I don't like being this philosophical and I plan on some blue in Billy's near future. 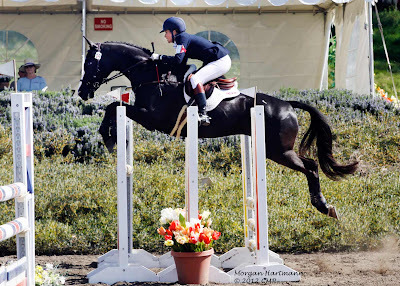 Our preparation leading up to this competition was aggressive, but his qualifications were minimal with only having run two Intermediate horse trials prior to the 2**. We knew that Billy probably needed more practical experience in the "real world" with more runs under his belt to be competitive at this level, but I have already admitted that we weren't competitive, haven't I? Nonetheless we were qualified, and the two runs that he had at Intermediate were clean, albeit painfully slow, so we entered the CIC 2** with the idea that he was ready for the challenge and it was smart to get the qualification in sooner rather than later. Billy was certainly eye-catching at the trot ups. He was all business, with no trademark Billy shenanigans, and just floated across the lane with a gloriously loose trot that was straight and true. Confidence was high heading into Dressage the next day. 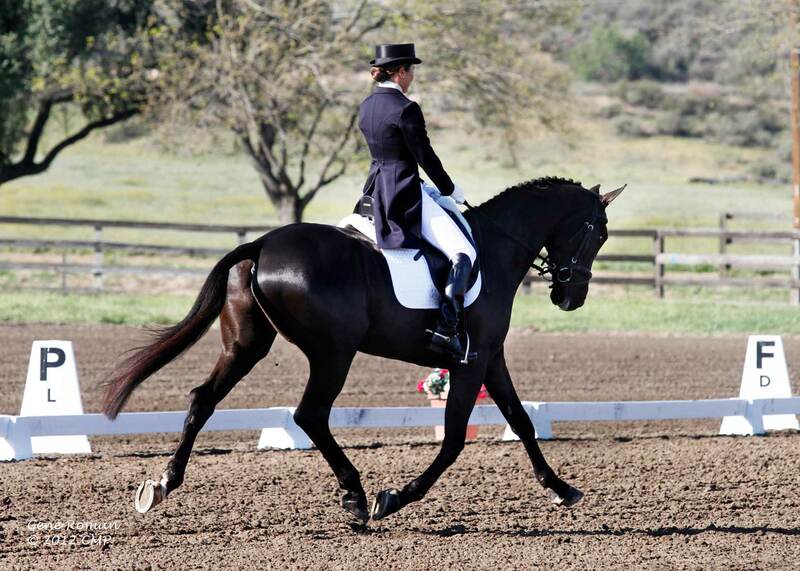 We did not disappoint when it came to the Dressage arena. As promised, a proper warm up routine was found for Billy, and he was focused and rideable in our test. We only had one clear mistake in the first counter canter, but otherwise, it was a career best for us and we scored very well to be in second place at the end of that phase. Of course I knew that Billy would score well if he would ever just behave in the sand box. 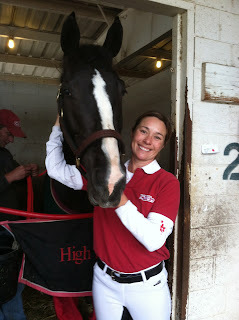 But, I can honestly say that I was surprised at his placing in his first 2**. 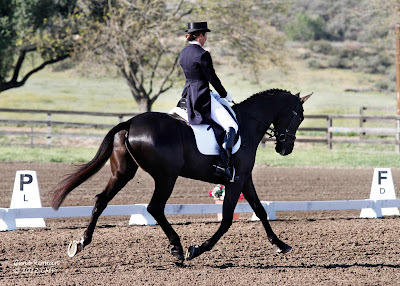 I always ride as well as I can and do my best, which in the past has not convinced Billy of Dressage's importance to the sport in any way, so I did not anticipate being in striking distance of winning at this show. Stadium was later that day because of the CIC format, so I really didn't have much time to dwell on his placement and let it affect me. As it was, we jumped the big fences in the stadium really well. It was those pesky little verticles that were the bane of our existence and we had three down. The course proved very difficult for most of the entries, and we were mercifully only dropped to fourth after our show jumping performance. Triple bars are our "feel good" fences! The final phase of the CIC 2** was cross country the following day. I had plenty of time to think of trying to move up into a better spot, proving ourselves, better prizes, more glory, etc., ad nauseum. I am not sure why I was concerning myself with any of this, since the plan was always to just get around and give him a good experience regardless of placing. And he certainly had not been fast enough in his first two OI horse trials to suggest that I could be remotely competitive here, so I have no real excuse for straying from the plan. All I can say in my defense is that I am an inherently competitive person. Wouldn't you expect a hungry shark to eat a seal if it was in his path? I had what I thought was a tasty seal waving in front of my watering mouth and I just had to go for it. The (new) plan was to be ahead my FIRST minute, mistake number one. 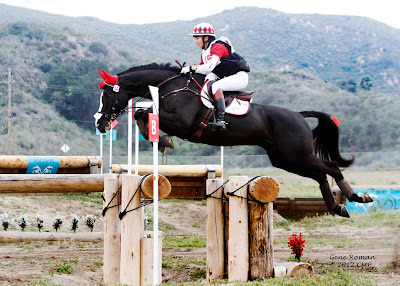 I did not settle into a comfortable rhythm out of the box, but instead ran like a banshee on fire and at the faster speed Billy was a little unsure if we were jumping cross country or fleeing from a Warmblood-eating monster fond of flashy blacks with white blazes. He was a little out of sorts and I put him to a few uncomfortable distances at the second and third tables on the way to our first combination, a pair of airy oxers with ditches under them. I rode him forward (mistake number 2!) after the third fence to set the tone and get him in gear in anticipation of the first tough question. To my delight, he did not even look at the first ditchy oxer at all (maybe because we were running at top Warmblood speed?) and flew right in to the combination. I kept the hammer down and it looked as if we were on our way to making the notoriously long three stride to the next and more narrow of the ditch oxers when I realized we ran right by it. WHAT??!! Wait a minute, I am NOT the shark in this story?? I quickly whipped around in a small turn and popped over it without a second thought and galloped down to the table-coffin combo. I was still close to the minute marker, even with the little circle, so I thought I'd better keep hustling to stay up on my time...you can still salvage a placing with a 20 in a CIC. Mistake number 3. We gave the table a good jump, and we were on the line to the coffin, not Billy's BFF. After our little run by incident not 30 seconds before, I didn't trust him to do it. 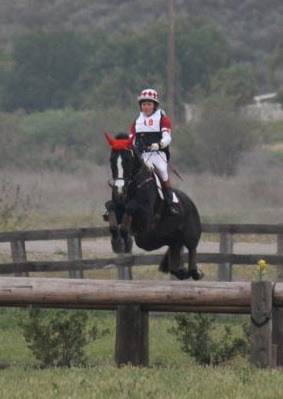 I bridged my reins and prepared to hail a cab after the log in and over the ditch. Mistake number 4. Well, he jumped in without a fuss and I waived my little red whip in the air to make sure he saw I meant business over this ditch. All he needed to see was that whip out of the corner of his left eye to know that I meant "GO! ", and go he did, to the right, as far as possible from the dreaded Billy-Beater in my left hand. We proceeded to jump the right side of the ditch and continue onto the path of the 1* out. There just wasn't enough time for me to get my left hand back on the rein and get him to my out. I circled and popped out over the 2** C element. Another 20 to add to the score. No more qualifying score. FAIL. These are the things swimming around my pea-brain. After that jump I had a long gallop to mull things over. I had become the seal in this scenario, the victim! But unlike the poor seal, I was just being the victim of my own stupid riding! I needed to get my head clear and salvage this ride to give Billy the experience he required or I just needed to put up the white flag. Time to be the shark, no more mistakes! 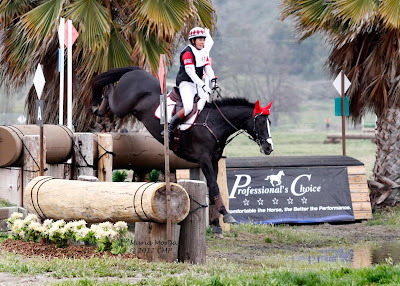 I resolved to think about what my horse needed to make it around the rest of the course since I already had used up my allotted two stops before ever reaching fence 7. Of course, the next jump had a ditch under it, so I would know soon enough if I was going to have a short day at the office. Fence 7 proved to be understandably a little impressive to Billy after our ordeal, but he trusted me and went like a helicopter over it. We managed to get into a rhythm and ended up having a very positive ride over the remaining fences on the course, with strong encouragement from me over the rest of the ditches. There were several advanced questions and he answered them with a yes. We ended up on the same page the rest of the way and finished the course and crossed the finish line. The one stride into water after fence 7. We were getting our mojo back. Dropping off the normandy bank.after one stride across. We had four bending strides to a corner after the drop. The corner following the normandy bank. So there you have it, our first CIC 2** experience together. A whole lot of growth, learning, and maturity. It's not always what you hope for, but this sport of Eventing serves up a lot of "unexpected". The great thing about it is that the journey is so remarkable, the end result can be almost insignificant.